Editor's note: Feature photo shows Kurt Leichssenring of ToyMakers of East Lake repairing one of many bicycles the ministry gives away each year. For a child at Christmas, a shiny two-wheeler with spinning power can be the best gift imaginable. And for hundreds of homeless people, a bicycle is a lifeline for holding onto a job or keeping a medical appointment. Trevor Charlton of ToyMakers of East Lake works on a bicycle as part of a ministry that started at East Lake UMC, Palm Harbor. Photo from ToyMakers of East Lake. United Methodist churches across the state conduct outreach bike ministries to fulfill Christmas wishes, as well as donate hundreds of bikes year-round to adults in need. "I can always find homes for bikes," says Trevor Charlton, who several years ago founded a bicycle ministry at ToyMakers of East Lake, a nonprofit started 32 years ago at East Lake UMC, Palm Harbor. ToyMakers also is known for brightly painted wooden toys made by volunteers and donated to sick children at All Children's Hospital and Ronald McDonald houses. Right now, the bike ministry focus is on refurbishing 50 or so children's bicycles to donate to various organizations in Pasco, Pinellas and Hillsborough counties for Christmas giveaways. At other times, the ministry will give away up to 400 bikes, mostly to adults. Edgewater UMC, Port Charlotte, Ocala First UMC and Orange Park UMC also host bike ministries. It can be hard keeping up with demand. "We usually don't have a bike for everyone," says Tom Ballard of Edgewater UMC. He and his wife, Elaine, along with other church volunteers, work all year to refurbish bicycles. "We're trying to give transportation to people, especially the homeless who need to get around for job interviews or to better themselves," he says. Volunteers of all ages and backgrounds can help in bicycle ministries. Above, Sarah Scharf of East Lake ToyMakers makes sure bikes are ready for new owners. Photo from ToyMakers of East Lake. Volunteers from Edgewater UMC, Port Charlotte, unload bicycles that will be repaired and recycled to new owners in need. Photo from Edgewater UMC. Each year, Edgewater gives away 400 to 500 bikes, and about the same number are repaired. People line up on Wednesdays for a bicycle or bring one in for repairs. It takes six to eight volunteers to keep up, Ballard says. Other weekdays, at least one person is in the workshop doing repairs. "You'd think it was a regular bike shop, except we don't sell anything there," Ballard says. Bicycle donations to Edgewater and other ministries come from individuals, businesses and sometimes from law enforcement agencies. Ministry support often comes from selling the newest bicycles at church thrift shops or by charging nominal fees to the public for repairs. Edgewater UMC gets bikes from several nearby police departments and sometimes partners with the nonprofit God's Pedal Power in Tampa to share bikes and parts. "They can be in all kinds of conditions, from brand-new to something police found in a canal," Ballard says. To the north, ToyMakers also has cultivated a steady supply from generous donors. CSX in Jacksonville recently donated two large freight containers of bicycles. Pinellas Suncoast Transit Authority surprisingly has dozens of bikes that get left on buses, and has donated as many as 20 a month, Charlton says. Toymakers has supplied bikes to a homeless tent city and The Salvation Army's Sallie House in St. Petersburg, the Islamic Center of the Tampa Bay Area, Union Street UMC in Clearwater and the nonprofit AMI Kids in New Port Richey. 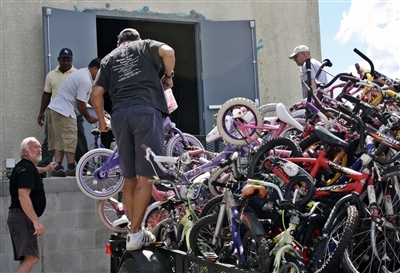 About 25 bicycles recently went to the VFW in New Port Richey and 10 to a Haitian community in Tampa. In 2010, ToyMakers sent about 70 bikes to help relief workers after the devastating earthquake in Haiti. 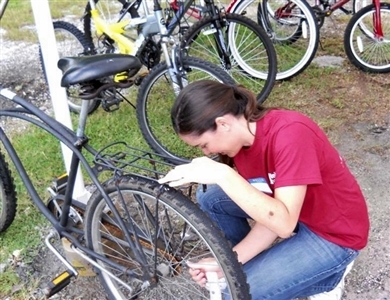 For bike ministries, willing hands are about the only qualification volunteers need. "I'd only worked on a single-speed bike when I started," says Mac McCampbell of James Boys at Orange Park. "Another guy had fixed a flat tire. We had to learn as we go." 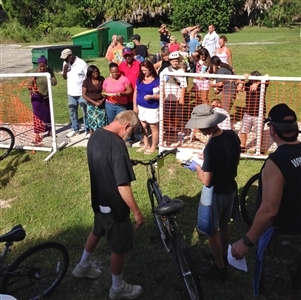 Community members line up outside Edgewater UMC, Port Charlotte, during one of the church's bike giveaways. Photo from Edgewater UMC. The James Boys annually give away more than 200 bicycles to underprivileged children at a Christmas party organized by J.P. Hall Children’s Charities. “They are very excited," McCampbell says. "We let children go in by themselves and pick out the one they want. That's what it's for." Each month, about 20 bicycles go to Mercy Support Services, a nonprofit coalition of churches and local organizations that serve people in need. In addition, the ministry supplies about 80 to 100 bicycles annually to homeless people who need them for transportation. About eight or so core volunteers help out. Recipients must put in a little sweat equity in the form of helping out with repairs, McCampbell says. The James Boys are well-known in the community. "When children outgrow them (bicycles), they turn them over to us," McCampbell says. "Sometimes the bicycles just show up. They'll just be there outside the church, word of mouth." At First Ocala UMC, bicycle giveaways are part of an umbrella of services provided once a week through the church’s Tuesday Morning Ministries. After four years, "it's a well-oiled machine," says Evelyn McRae, a former teacher and courthouse mediator who coordinates the ministry. Volunteers in the James Boys ministry at Orange Park UMC turn out hundreds of bikes each year to underprivileged children and homeless people. Photo from Kenneth Plummer. On Tuesday mornings, people come for clothes, shoes, toiletries, tents and sleeping bags. They also get help filing for birth certificates or other identifications needed for job applications. And they can request a bike. Volunteers come from the church and community, including a homeless coalition and local service agencies. They help with bike repairs, conducting interviews, keeping track of inventory and ordering bike parts. After the distribution, a worship service is held. Since January, about 50 bicycles have been given away. "There are new people coming in here all the time,” McRae said. “A lot of them are laborers, and a lot of the jobs are some distance away. They tell us over and over that they are appreciative. You can imagine walking 10 miles to get somewhere. Not only is it energy but time to them. It gives them a chance to get a job." For volunteers, bike ministries are a labor of love. At ToyMakers, teenagers often come because they need to log community service hours for scholarships. But, Charlton says, some stay longer. "To me, it's a great opportunity for youngsters to get involved in something they both enjoy and also something to help others," Charlton says. "I take these youngsters with me so they see where the bikes are going. East Lake is a very affluent area, so it's good to see there are people desperately in need." -- Kathy Steele is a freelance writer based in Tampa.